Happy Tuesday, my friends! We are back with another installment of Tuesday Tidbits, where I try to track down events that I think would be of interest to you, my fellow Geeks here in Indiana! I hope everybody had a fantastic weekend! We spent Saturday immersing ourselves into “maker” culture at the Midwest RepRap Fest, specifically 3D Printing culture. We tried to win some printers, I got some filament, and we had a great time hanging out at the SeeMeCNC booth, shooting the bull with some folks for Friday’s Indiana Geeking Podcast episode! We’re now motivated to finally start moving ahead with the 3D Printer that’s been gathering dust and cat hair for the last few years, and I spent yesterday cleaning it, replacing a part on it, and getting it set up. After three attempts, I think I’m about 80% of the way through bed levelling, and I’m hoping to finish that up this evening! April is here, and it’s busy! April 6th: Oddities & Curiosities Expo! Are you into things like taxidermy, skeletons, and just the general strange and unusual? Check out this event, happening at the State Fairgrounds in Indianapolis. April 7th: Foam Armor Building Workshop! Held up in Lafayette, this is a “how-to” workshop, focusing on EVA foam construction, hosted by the awesome craftsmen of Wulfgar Weapons & Props. There are limited spaces available, and it is not free, so head on over to the Facebook Event Page to see all of the prices, and see if space is still available! April 8th: Shazam Screening with Kinda Nerdy Night Out! KJ from Kinda Nerdy and PopCon Indy will be hosting a screening of the newest DC film, Shazam, at Studio Movie Grill in Indianapolis! Check the link for more details! April 14th: Ash Comic & Toy Show! Back at the Rodeway Inn in Indianapolis, this long-running show has a ton of long boxes to dig through, and cool toys to check out! Check out the link for more info! April 25th: Mick Foley @ The Toy Pit! Our friends over at The Toy Pit are hosting a visit by wrestler Mick Foley! Information, including photo op and autograph prices, can be found on the Facebook Event Page! April 26th – 29th: RollPlus Con! It’s a game con/sleepover down in Trafalgar! A place to sleep, breakfast, and dinner are included for this weekend of games and community! Check it out, there’s just a few slots left for this fun weekend! April 27th & 28th: LaffyCon! Back in Lafayette for the 5th year, LaffyCon is a pop culture convention held at the Market Square Shopping Center! Take a look at the link for more information! Let’s look ahead to May! May 4th: Star Wars Day! There are going to be so many events, including events at the Children’s Museum, with the Indianapolis Indians, and Naptown Roller Derby! Watch the blog for a post laying it all out that week! May 4th: Free Comic Book Day! This is a huge day for your friendly local comic shop! Keep an eye on the blog the week of the 4th for information on what some of the different shops will be doing! May 10th: Wishes, Wands & Wine – Harry Potter Trivia Night! Friend of the blog KJ is helping another Make a Wish kid’s wish come true! Join her at Blackhawk Winery & Vinyard in Sheridan for an evening of, dare I say, magic! Costumes are encouraged, you buy your ticket for your house, and there will be games and trivia as they all work together to send Isabelle to London! May 18th: South Bend Comic Convention! This is a one day show held at the Comfort Suites. Check out the Facebook event page for more information! May 23rd: The Head Geek’s Birthday! I haven’t done this in a few years, but that link is to my Amazon Wish List. I mean, why not? Today’s Picture: It’s new profile pic time over on Twitter! This month, I’m focusing on Patrick “Lil Doodles” Handlon. This was artwork he did of me when I wrote the forward to one of his trade paperback’s last year, and I KNEW it would be a great pic for April, and the upcoming release of Avengers Endgame! Check out my pinned tweet over at Twitter for all of his info! Twitch – After doing it for a week, I think I’m going to keep it up. Once or twice a week, I’m going to stream my process on editing the Team Geeking Family of Podcasts. Now, in all honesty, this in and of itself is pretty boring. I’ve got a simple setup, with my webcam showing in one corner, and Audacity showing in the rest of the screen. Everything is silenced, so there are no spoilers for upcoming episodes. However, I’ve had a few people pop in and ask questions, and it looks like a great way to share the little bit I’ve learned about the process. So, if this interests you, subscribe to my stream, and keep an eye on Twitter for when I’ll be recording! Ko-Fi (Immediate) – This enables you to “buy me a Raktajino” and the money immediately goes to PayPal. This can help with immediate bills! Patreon (Long-Term) – This helps long-term, month-to-month. I can not stress this enough, my friends! If people just gave a dollar a month, each, that goes so bloody far for a creator like myself! So please, if you can, throw in here! Bonus: Patrons get extra things, like free sticker offers, weekly blog updates, discounts in the Geeking store, and more! 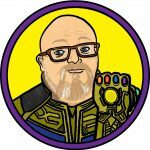 Geeking Shop – It turns out that while I’m a decent blogger and podcaster, I’m not great at the merch. I have a lot of stuff laying around the Geek Cave Office, taking up space, and I’m starting to drop prices to get it gone. Take a look! Note: I’m still going to be donating $2 from each Geek Dog and Geek Cat pin to EARPS until they’re gone.